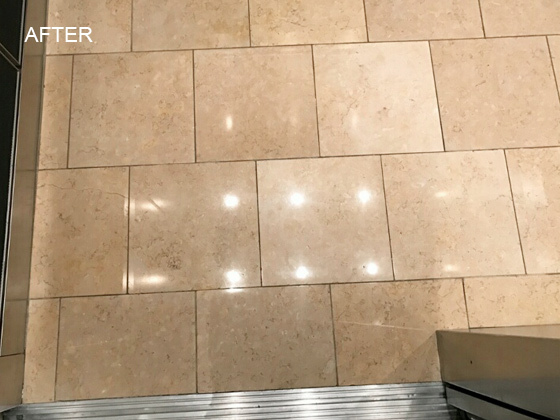 This is what the travertine elevator floor looked like when we arrived on the job, before any travertine restoration work was done. 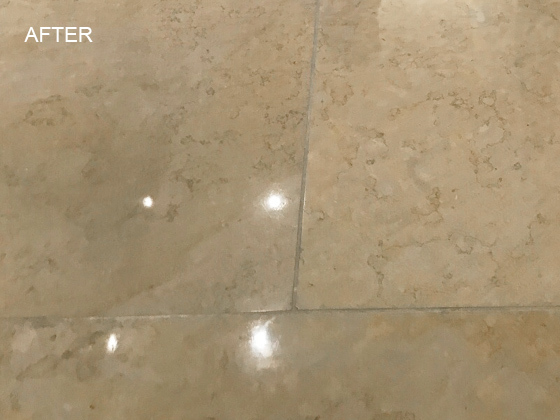 Here is the same travertine as the previous image, after restoration was complete. Notice the difference. This is another elevator floor image taken before work was done. See how the dirt and grime is embedded in the travertine. Here is the same travertine as the previous image, except it has been cleaned and sanitized. This image was taken as we stripped the coating from the floor. The coating was functioning essentially like a dirt magnet. Here is another travertine stripping image. 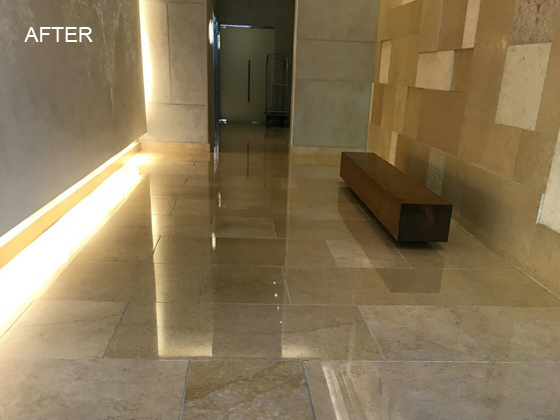 This image was taken after we honed and polished the travertine. 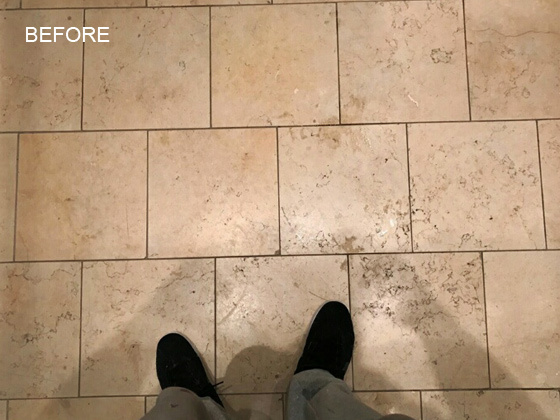 See how beautiful the travertine looks with a lasting natural polish instead of a temporary coating. This stripped and polished travertine floor looks elegant once again. Even the travertine in the high traffic entry way looks great! 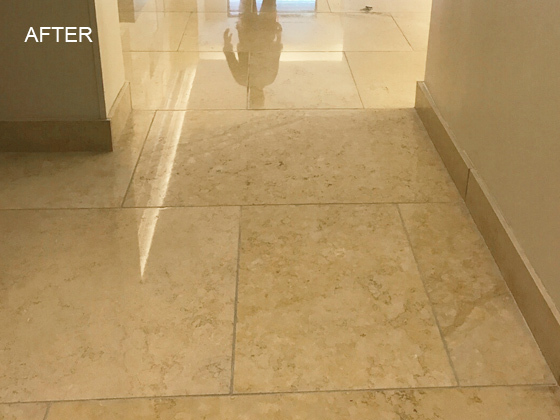 In an eight story luxury condo in the Tribeca neighborhood of NYC where apartments can sell for anywhere between three and eight million dollars, the travertine floors in the lobby and the elevator were in need of restoration. The grout lines were dark and prominent and foot traffic had taken a toll on the finish. There were a lot of scratches, as well. 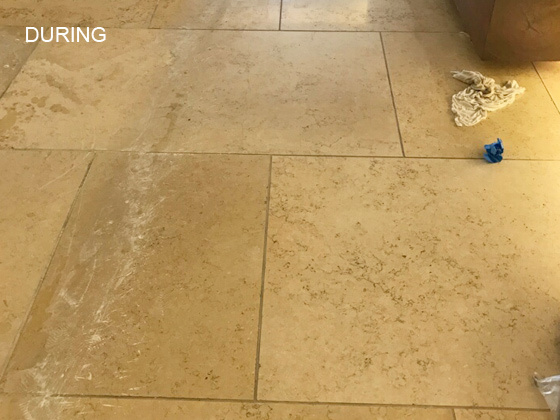 First, we stripped the surface to remove any coatings that had been applied to give the travertine a temporary shine (completely unnecessary if the stone has a natural polish). Then, we honed the travertine using our floor machine mounted with diamond abrasive discs. This was a multi-step wet grinding process that removed all of the surface damage. 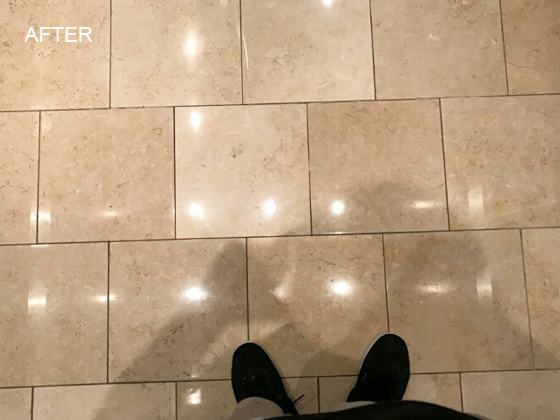 The next step in the process was to refinish the floors, using a combination of polishing and crystallization to achieve a reflective, natural polish. First, we polished the stone using polishing compounds and a series of progressively finer grit diamond pads. Then, we crystallized the travertine. Crystallization is a process that uses abrasive-generated heat to cause a chemical reaction on the surface of the stone, resulting in an enhanced shine and increased wear resistance. See for yourself the dramatic difference between the BEFORE and AFTER images. The property manager was so pleased with the outcome of our work that he scheduled Hi-Tech Floor and Surface Care as his go-to company for quarterly floor maintenance. 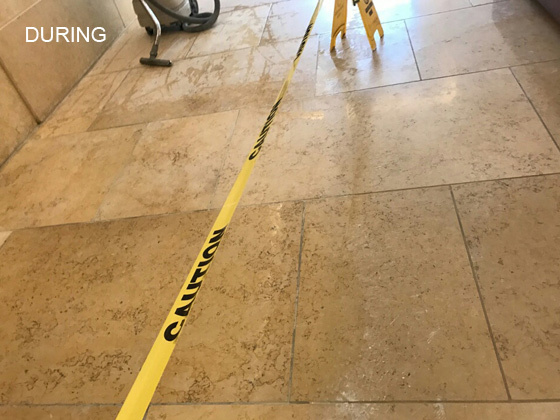 To learn more, visit our Travertine Services page, and while you’re there, be sure to watch our Travertine Repair and Restoration video. 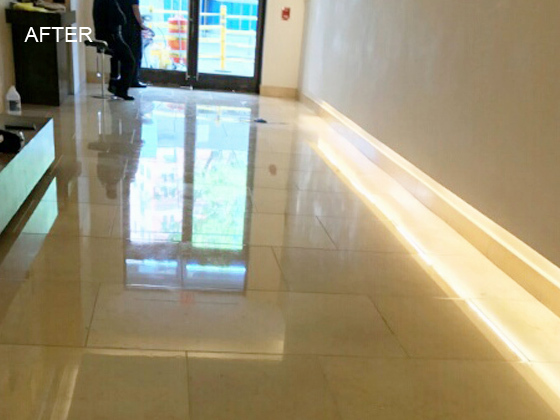 Call (914) 423-4600 or contact us online for a FREE estimate on travertine repair and restoration or any of our other services in the Tribeca neighborhood and throughout the greater New York City area.